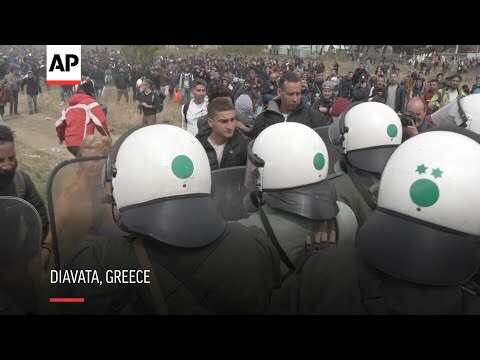 DIAVATA, Greece (AP) — Protesting migrants clashed with police in northern Greece for a second day Friday while migrants in Athens also blocked the city’s main train station in demonstrations that authorities said had been triggered by false reports on social media that restrictions on travel to northern Europe had been lifted. The clashes occurred outside an overcrowded migrant camp Friday, where police used tear gas and stun grenades to push back hundreds of protesters carrying their belonging and trying to walk to the border between Greece and North Macedonia about 60 kilometers (40 miles) to the north. Several hundred migrants, many having spent the night outside the camp in tents or sleeping rough, were involved in the clashes in a cornfield where police set up several blockades with buses and lines of riot police officers. Hashem Mojadam, a 36-year-old Iraqi asylum-seeker, spent the night in the field outside the refugee camp and said he hoped to join other migrants and walk to the border. Migration Minister Dimitris Vitsas issued a plea to migrants to return to camps that are officially known as hospitality centers. “There was a false report being distributed that the border would be opened. We have informed the hospitality centers that is not the case,” Vitsas told state-run ERT television. Greece’s border with North Macedonia has been fenced off and heavily policed for the past three years after the European Union cracked down on migration because more than a million asylum-seekers traveled to EU countries, most fleeing war-torn areas in Iraq, Syria, and Afghanistan. In Athens, police said about 300 protesters gathered Friday at Larissis Station near central Athens, with many sitting on the tracks in front of trains. Authorities didn’t immediately intervene to disperse the demonstrators, while officials from the United Nations refugee agency, UNHCR, were trying to persuade them to leave voluntarily.